North Coast Imports, Inc.: "My Cat/Child Would Destroy That!" This is a phrase we hear all the time from people who love weight-driven clocks (like cuckoo clocks!) but are concerned that their young child or pets might get a hold of the chain or weight and pull the clock down. It is surely a concern. We know that it can be nearly impossible to child-proof or pet-proof a modern home, without even considering adding a timepiece. 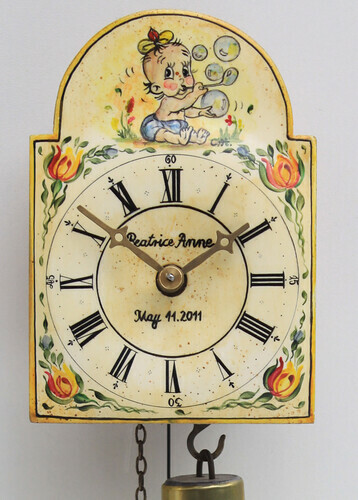 But consider this: There is nothing quite so personal, or thoughtful, as a gift of a clock to a young child. It's something that the child will grow up with his or her entire life. They might even regard a clock as an old friend or at least a remembrance of your love and care. There are very few gifts which actually last a lifetime. A mechanical clock is one of those things. While the child is small, don't worry about needing to keep the clock running all the time. Sometimes they might just like to see it run now and then... possibly they might enjoy the soothing tick-tock sound while they are asleep in their crib. When the clock is not running, loop the chain around the top of the clock so that it doesn't hang within reach along the floor. 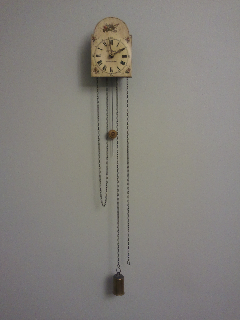 You could also hang the clock above a shelf or a dresser so that the clock is completely inaccessible from the floor. It doesn't do the clock any harm NOT to run, or to have something impede the fall of the weight. You have other devices and tools to tell you the time. While mechanical clocks do keep excellent time if you need them to, I think that their more important function is to provide a kind of kinetic sculpture. Ordinary timekeepers (like your cell phone or the clock on your microwave or computer) fill an important function as a tool, but a mechanical clock does so much more. You don't really need to run them all of the time, so for now gather up the chains and share the enjoyment of a mechanical clock with your young child. They'll love it!